The day the Plaza cinema was opened on Crosby Road North in Waterloo, it made history by being the only cinema to be opened and closed on the same day. The day was 2nd September 1939 and due to the onset and declaration of World War II the government ordered all cinemas and places of entertainment to be closed due to fear of bombing. 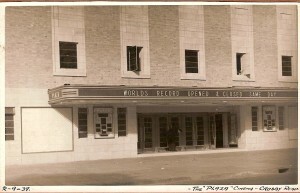 Calls were quickly raised to re-open the cinemas and within two weeks the restrictions were lifted. The cinema was a place where the public could be entertained, to take their mind away from rationing and the harsh realities of war as well as an escape for a few hours into the magical world of film. It provided a way of helping keep up spirits and would later be used as a useful tool in providing information about the war efforts and a way of communicating public information to large audiences through films and government announcements. The newsreels and public information films made for the cinema gave the government a means of controlling what and how information was given to its audience as tighter controls of film censorship took hold. Film makers such as Humphrey Jennings, David Lean and Carol Reed produced British films to rival Hollywood. These gave accounts of British life through the war and served as a purpose to boost morale, giving a reflection of war all be it with a certain slant which could now be deemed as propaganda to a cynical eye. Films such as ‘Listen to Britain’ 1942 directed by Humphrey Jennings and Stewart McAlister.’ ‘The True Glory’ 1945 directed by Carol Reed and ‘A Diary for Timothy’ also directed by Jennings in 1945. Of course not all cinema goers would want to watch films about the war, they wanted to go to the pictures to escape into the comforts and luxurious surrounding which the cinema provided. Unfortunately a few of our local picture houses were damaged and destroyed during the war years. The area was hit quite badly due to its close proximity to the docks. Old Picture Houses such as The Broadway, The Imperial and the Metropole were hit in strikes and closed. Bombing during the May blitz caused devastation not only to buildings and businesses but also to families, around the corner from where the Metropole stood a memorial stone has been erected in memory of those who lost their lives.